There is one star dish at Red Pepper that you will see every table order whilst the interior rapidly fills with a spicy-tinged smoke. 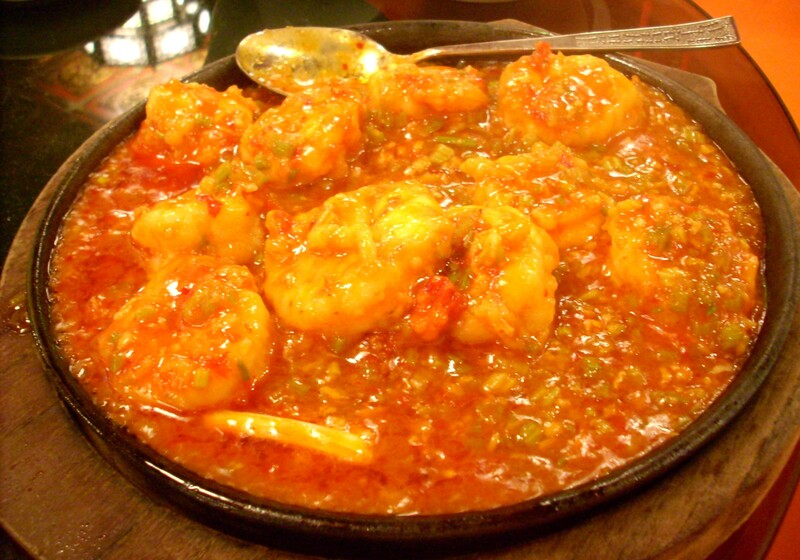 It’s the Sizzling Chilli Prawns and it’s amazing. Those diners aren’t raising their napkins in horror but merely in anticipation of smoke stinging their eyes and sauce spitting away in a highly delicious manner! Huge chunky morsels of sweet tender meat, coated in an unctuous spicy-sweet secret recipe sauce, all served on a sizzling platter. It looks near-radioactive in photos and sure enough, get ready for a sensational taste explosion. It’s my favourite dish and the one that always keeps me coming back for more. Be sure to ladle all that special sauce onto your rice afterwards! 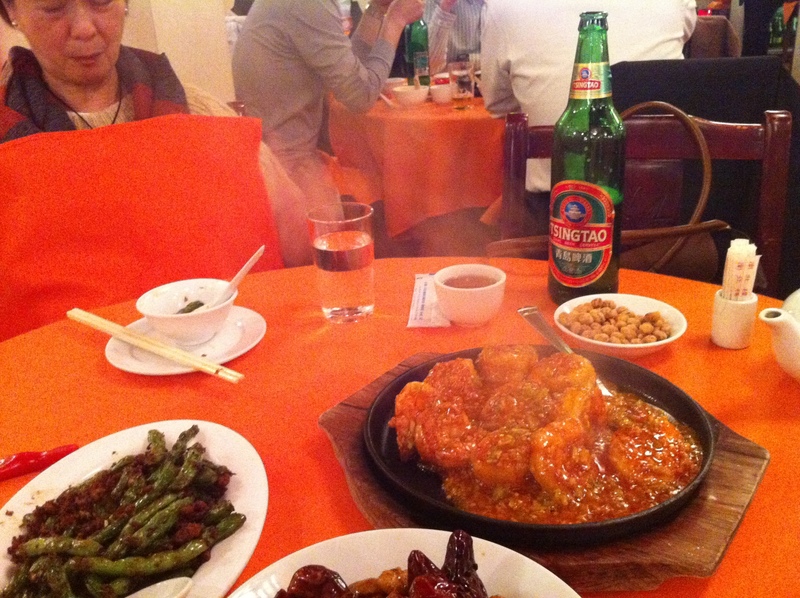 The Sizzling Prawns (yes, they deserve capitalisation) are without a doubt the star of the show. I’ve tried the dish at numerous other Sichuan restaurants and I do think these are the absolute tops. So there. Elsewhere, the menu can be a bit hit and miss and some of the fare that bulks out their menu can be found (and better) at more standard eateries in the city. Sticking to their signature dishes, there’s a sweet and sour garoupa, probably enough to justify the ‘just for gweilo’ accusations, and which I find a waste of this delicate lovely fish. The sauce is thick and heavy, smothering the nuanced flavours of the garoupa, already overwhelmed by batter and a jostling of other unnecessary ingredients. One for Chinese takeaway sweet and sour fans only, I think! Meanwhile, their diced chicken with chilli and cashew nuts signature dish is much better. The nuggets of chicken are tender and ideal for nibbling away on until suddenly they’re all gone, whilst the sauce is surprisingly light and subtly spicy, rather than the full head-blowing hit you might expect from the whole chillis that pepper the plate! 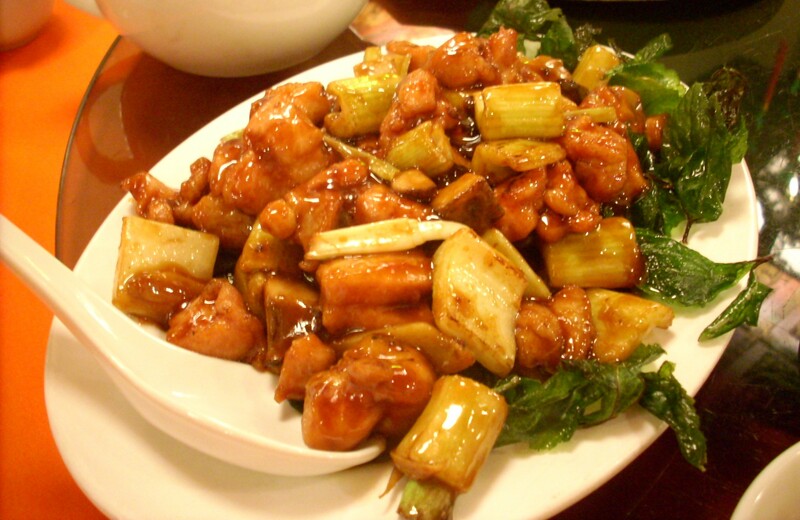 I actually prefer their other diced chicken dish, which has a more salty somewhat tangy sauce and much more of it (I’m a bit of a sauce fiend in Chinese restaurants). 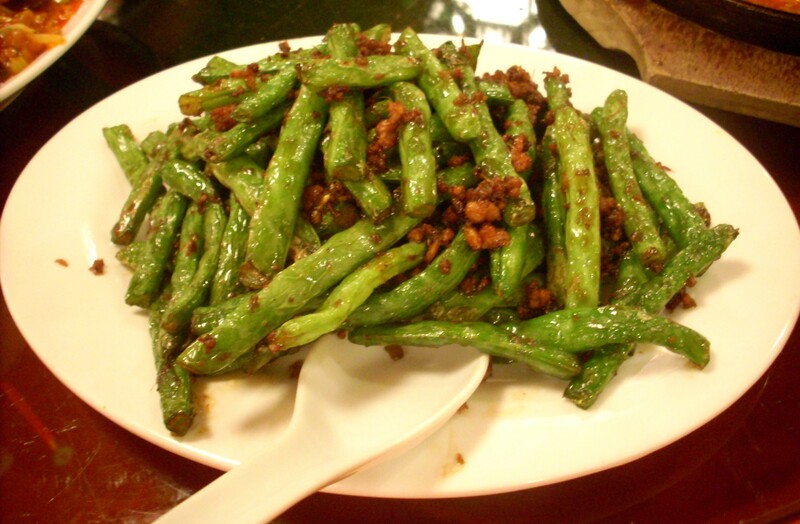 I’d also recommend the fried string beans with minced pork. I’ve not liked string beans before or since, apart from in the context of this dish, that’s how good it is! You can find it in lots of other Sichuan and Shanghainese restaurants and Red Pepper’s version hits all the right notes. So that’s fresh beans cooked to just the right texture (a bit of crunch but not enough to break your tooth on) and this wonderful mince mixture that’s both insanely salty yet sweet enough to keep it dancing on your palette. Their hot and sour soup also makes for a good traditional starter and it does everything you’d expect and a little bit more. 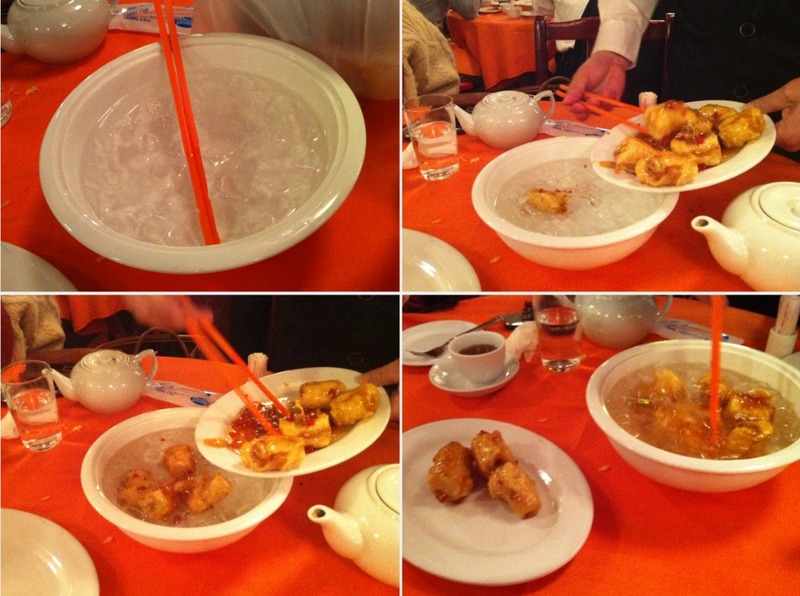 I also like that all their dishes come in medium or large sizes, so you’re not stacked with leftovers as can often be the way when small groups dine at Chinese restaurants. 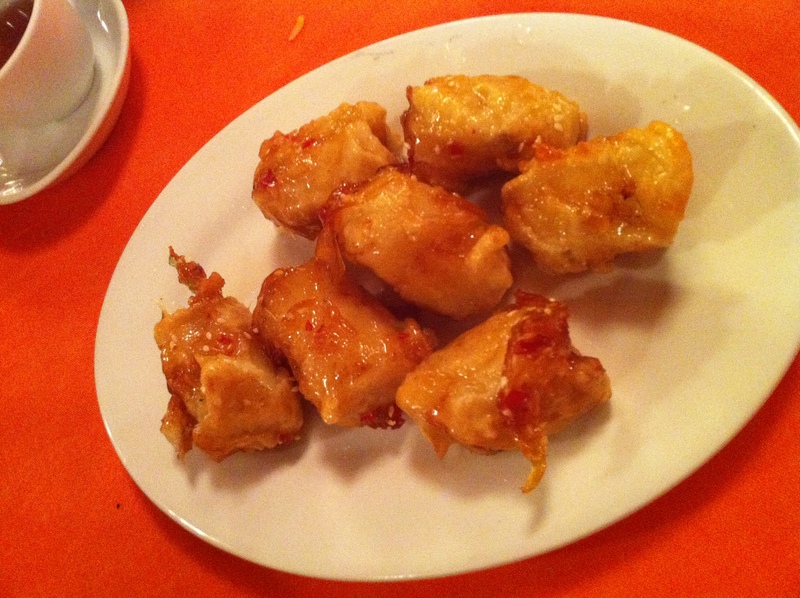 The must-have dessert is their banana fritters, which can also be found in most Chinese restaurants here and where the cooking process is almost as much fun as the eating! As with the plumes of smoke and raising of napkins that signal the arrival of the sizzling prawns, it’s all about the theatre. First comes a large bowl of ice cubes, then a plate of syrup coated segments of banana, with little slivers of cherry (not chilli as I’d alarmingly imagined!) clinging to the coating too. These are thrown into the ice, whereupon they snap crackle and pop with all the vigour of someone auditioning for a Rice Crispies advert. Then out they come – the Chinese equivalent of candy apples at the funfair, done with chopsticks throughout of course. Any so-called fritters you’ve had in the UK can barely lay claim to the term after you’ve tried these. The banana is soft molten goo whilst the syrup snaps on your teeth in the most pleasing way possible. It’s super-sweet, strictly non diet-safe and obviously utterly delicious. Red Pepper has a four-decade long history in HK and its retro décor belies this. 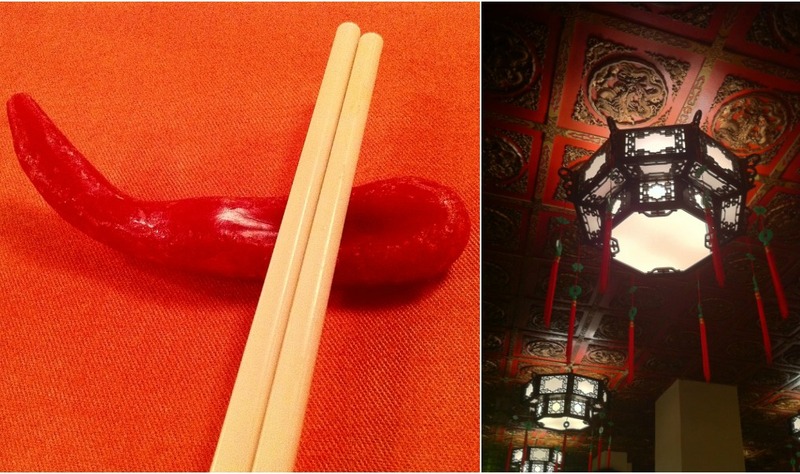 We’re in trademark old-fashioned Chinese restaurant territory here, with a dragon-carved dark wood ceiling, ornate tasselled lamps, orange tablecloths topped with Lazy Susans and reverential service from staff dressed like waiters rather than stage hands or clothes shop assistants. The atmosphere, other than the sizzle and sputter of the prawns, is generally a tad quieter than the crowded commotion of more local joints. As such, it’s special occasion dining with prices that reflect this – a meal of around four dishes, plus dessert and drinks (and you know it tastes better washed down with a bottle of Tsing Tao! ), should have you bobbling around the thousand dollar mark. Not unreasonable by any means, especially if you opt for their specialities rather than dishes you can get anywhere else in the city for significantly cheaper. So Red Pepper – just for gweilos? You saw the prawns, didn’t you?! If so, I don’t think I need to say any more! 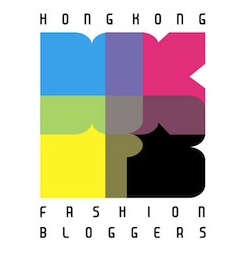 This entry was posted in Food, Hong Kong and tagged best restaurants in HK, best restaurants in hk to bring visitors, best restaurants in Hong Kong, best restaurants in hong kong to bring tourists, best Sichuan in Hong Kong, Causeway Bay, Chinese banquet, Chinese cuisine, eating out, F&B, fine dining, HK, Hong Kong, Red Pepper, restaurant, review, Sichuan cuisine, sizzling prawns, spicy, Szechuan cuisine, where to eat Causeway Bay. Bookmark the permalink. Hmm, my appetite suitably whetted by your review, time to hit the decks and check this place out. Question is, are the hot stuff really hot? A little spicy hot is fine with me, but no good if it’s rocket-launchingly hot. You’ll have to let me know what you think of it, if you do dare brave the Sichuan spices! Thanks for the support and encouragement and glad you like the restaurant reviews! I just write about whatever makes me happy – sometimes it’s food, sometimes it’s nail polish! Although I think the nail polish WOULD look fetching with the Kate Middleton wedding dresses! And I know I’m not writing to thin air – my mum and my boyfriend are contractually obliged to read daily 😛 I may even test the latter!